An evidence-based process for screening and assessing individuals accessing care in the addiction sector that assists the accurate identification of their needs, assists in developing a treatment plan, and in matching them to the most appropriate level and type of care. What is the system challenge? A 2006 evaluation of assessment practices in Ontario’s publicly-funded addiction treatment system (Rush, B. and Martin, G. 2006) found significant variation in the tools used to assess individuals accessing service and also in the length of time taken to complete their assessments. The evaluation also revealed that assessments were often conducted after a referral decision had already been made, making the assessment an administrative activity rather than a clinical one involving a rational, evidence-informed basis for treatment planning and referral. The latest research suggests the need for addiction sector screening and assessments to focus on concurrent disorders. The Canadian Centre of Substance Abuse states that it is “important for service providers to use standardized and validated assessment tools” to determine the level of problem severity for each individual client. The results of the assessment are to be used to “provide critical information for the development of a unique treatment plan” with the client. the GAIN Q3 MI ONT was demonstrated to provide a standardized and objective way to gather clinically comprehensive information. With support from the Provincial System Support Program at the CAMH, the Staged Screening and Assessment process is being implemented across Ontario's publicly-funded addiction programs. The process has four parts (three screening tools and a First Stage Assessment - see below). The first stage screener, Global Appraisal of Individual Needs – Short Screener (GAIN-SS), quickly identifies possible mental health and substance use issues requiring further exploration. 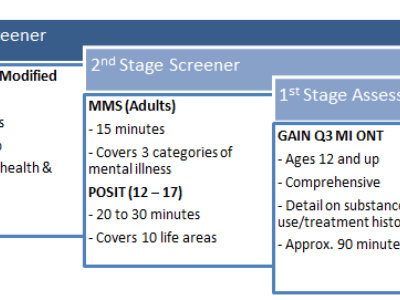 If the responses to the GAIN-SS raise concerns about potential mental health issues, the second stage screeners are used to gather more information. The screeners are the Modified Mini Screener (MMS) for adults, and the Problem Oriented Screening Instrument for Teens (POSIT) for those 17 and under. The Global Appraisal of Individual Need Quick3 Motivational Interviewing Ontario (GAIN Q3 MI ONT) is a comprehensive assessment allowing the client to share their life circumstances across a broad range of areas, with a particular focus on substance use. This assessment and the auto-generated clinical reports provide a sound foundation for treatment planning and referral decisions. SS&A diagram illustrating each assessment stage and applicable screen based on age group. An evaluation of current assessment practices, a literature review, and initial tool development, piloting and validation provided the foundation for provincial implementation. LHIN and service provider stakeholders were engaged. Provincial implementation plans were developed, including a process for training and certification. Communities were supported to determine the scope of the implementation and begin the process of selecting agencies and staff to begin implementing. Organizations began implementing the SS&A process. Over 150 organizations have been involved in training and certification to date. About 1,000 staff across Ontario have been trained and about 600 have reached certification. The implementation team continues to support agency implementation planning across the province. Work has begun on fidelity monitoring and sustainability plans. SS&A is currently being implemented across the province. As of April 2017, all LHINs are participating and more than 150 agencies are engaged at various stages in training, certification and implementation. Training and certification will be provided to more than 1,500 service providers by the time full implementation is reached. SS&A implementation involves engagement with all LHINs and funded addiction service providers across Ontario. Training and certification will be provided to more than 1,500 service providers by the time full implementation is reached. Tens of thousands of service users will ultimately benefit from the increased quality of assessment and treatment planning. SS&A implementation will continue to be supported by the Provincial System Support Program at the CAMH. The focus moving forward will be on transitioning the system to the use of these tools in everyday practice.